The ‘ber months is here and the Christmas season is right around the corner. It is no wonder why a lot of bazaars and weekend market are sprouting everywhere. These events are a treasure box of good and delicious finds. Among these bazaars and weekend markets, the most exciting will most probably be a weekend food market that is a one-stop shop for anything gustatory. 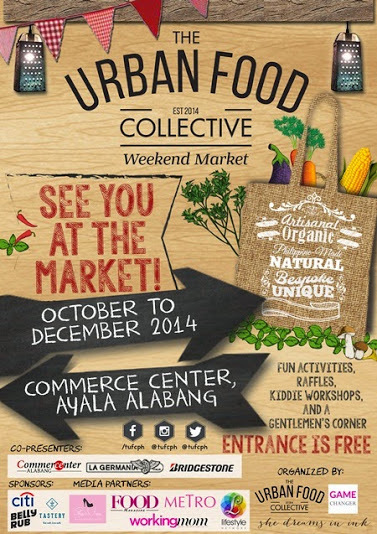 If you are a connoisseur, a cook, or a foodie, or if you happen to live anywhere near the Ayala, Alabang Commerce Center, then it is about time you check out the Urban Food Collective Weekend Market. Read more about it. TUFC understands that food brings people together, that food is at the center of some of life’s best moments. Its vision is to be the premiere food community in the country. This entry was posted in announcement, food press and tagged food events, weekend food markets on 2.October.2014 by admin.